This piece by former Texas Collection director Kent Keeth originally was published in The Baylor Line in November 1989, then was reprinted in Looking Back at Baylor (1985), a collection of Keeth and Harry Marsh’s historical columns for the Line. Blogging about Texas periodically features selections from Looking Back at Baylor, with hopes of sharing Keeth’s work with a new audience. Exactly 110 years ago, a Waco University alumnae came to the Baylor University campus in Waco, TX to see what had become of her alma mater. 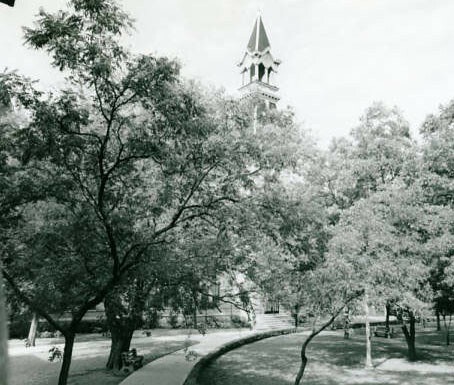 In the years since her graduation in 1873, the campus had changed quite a bit. If only she could see it now! Read on to hear her description of the expanded campus in 1908. When young Celeste Patton received the degree of Maid of Arts from Waco University in 1873, that school’s campus was located in two buildings on Fifth Street at Clay Avenue, adjacent to First Baptist Church. During the following years, however, great changes occurred at her alma mater. In 1886 Baylor University closed its campus in Independence and moved to Waco to merge with Waco University. The consolidated institution, known for several years thereafter as “Baylor University at Waco,” immediately began to construct a new campus at its present location several blocks farther south. Thirty-five years after her graduation, Celeste Patton Edmondson paid her first visit to the new campus. Recalling the cramped facilities of her own college days, the returning alumna viewed the enlarged university’s four buildings and athletic field with amazement and admiration. In the following letter written in April 1908, Mrs. Edmondson detailed to a former classmate the wonders which she had seen. . . . . And now I would like to be able to picture to you Baylor University. My children have often told me that the ‘campus was beautiful, the buildings fine,’ but my imagination had never conceived all their beauties. The grounds are on a natural elevation and have been raised some until they are at least three feet above the street. There is a landscape gardener employed, who keeps them in a perfect state of cultivation and cleanliness. The walks are all cemented and they and the steps going up from the streets at different angles are polished until they look as smooth as marble. Flowers of many different kinds all along the borders and roses in profusion, ivy covering the walls of the two oldest buildings, which are the university proper and Georgia Burleson Hall, where the girls board. Then on opposite corners of the grounds are the Carroll Buildings. The Science Hall, donated by George Carroll of Beaumont, cost sixty thousand; and some recitation rooms are in this, the laboratories and all appurtenances for teaching the Sciences, and the printing or press rooms used by the students. Then in the basement or lower floor is the museum, and I could not enumerate in days the curios they contain, eggs from every kind of fowl on the American Continent, many of the fowls themselves, in a perfect state of preservation, all kinds of reptiles and every kind of animal from the largest to our common house mouse. The jawbone of the whale occupies more space than any other one thing. From the foreign countries are many things too, even the heathen idols, these last contributed by different ones of our foreign missionaries. The Curator has rooms on this floor and his are exempt from intrusion. On the opposite corner from the Science Hall is Carrol Chapel. Then in the grounds and midway between these buildings is the bronze statue of Dr. Burleson, a tribute from his old students…This tribute is insignificant compared to their appreciation, or to the noble mind who planned such great good to future generations….I am sure that Dr. Burleson’s ‘mantle’ has fallen on worthy shoulders, but O! there never was, nor will be, but one Dr. Burleson. . . . . I did not complete the University description – could not – but they have an athletic field back of the Campus, where they play baseball, football and even give circus performances all by the male students. This field is walled in and they have a grandstand and part of the admission fees charged at these games go to the improvement of this athletic field. At this point Mrs. Edmondson turned her attention to the other attractions of the city from which she had so long been absent. She concluded her lengthy letter to her friend with several pages of equally detailed descriptions of the Baptist churches to which she had paid a visit during her stay in Waco. Nice article. Wonder when Baylor added the athletic facilities. Also, there may have been a tennis court more or less beside both Carroll Library and Georgia Burleson which could not be viewed from the angle of the “birds-eye” photo/drawing. Also wonder what is the date of the birds-eye picture used in the article. Wonder if there is more detail about the trees and flowers in Burleson Quadrangle.